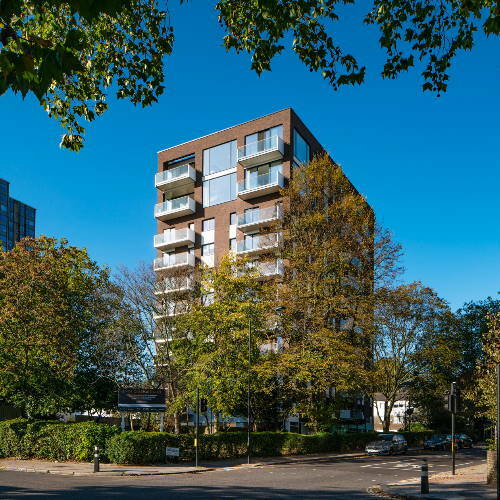 Kings College Court is a flat roofed nine storey residential block of 48 apartments in Primrose Hill Road; one of London's most desirable locations. It was constructed in 1969 of reinforced concrete framework and external brick panels and single glazed metal windows. It has been reasonably well ‘maintained’ but no improvement work has been carried out since it was constructed. It is now becoming dated and ‘tired’. The flat roof covering is at the end of its life and the metal windows are poorly fitting and thermally inefficient. The brickwork has poor thermal insulation qualities resulting in significant heat loss and cold bridging internally. The common parts are in need of a modern upgrade and an improvement to ventilation. The approach roads are congested and poorly maintained. Employing a team of award winning architects Pirton Limited has obtained planning consent to add a further two floors comprising three large apartments and a stunning Penthouse. In addition to the new work the whole building and site and approach roads are being transformed. The brickwork is being covered in an insulated ‘Sto’ system, all windows and doors are being replaced with double glazed powder coated aluminium and a new balcony is being fitted to each living room. A new front entrance is being formed as part of the new glass entrance porch. New Lifts are being fitted and the common parts are being refurbished. Incoming services are being improved and the approach roads are being altered and resurfaced and additional security provided.